Star NHL players were some of the attendees. The Hunter Brothers perform the national anthem during the Country Thunder Humboldt Broncos tribute concert in Saskatoon on Friday. SASKATOON — Canadian country singer Gord Bamford reached over after performing the song "Little Guy" and grabbed the hand of Carson Haugan, the son of late Humboldt Broncos coach Darcy Haugan. 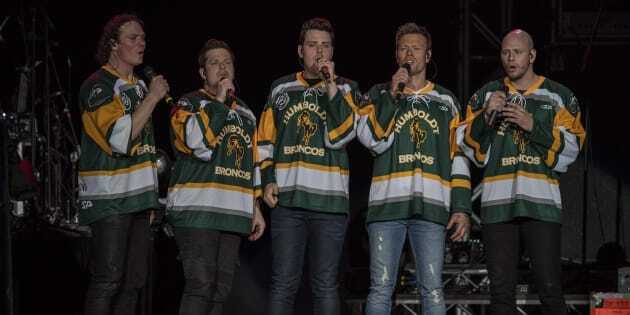 Carson, wearing a white Broncos jersey, was given a standing ovation by the crowd of over 10,000 that packed SaskTel Centre Friday night for a tribute concert to remember those killed in the April 6 bus crash. "That was a tough one for me," Bamford said after finishing the song he wrote for his own son, Nash, who was also on stage. The Broncos were on their way to a Saskatchewan Junior Hockey League playoff game when their team bus and a tractor-trailer collided at an intersection. Sixteen people — including 10 players — were killed and another 13 people were injured. Chants of "Go Broncos Go" rang through the crowd as Broncos family members and current and former NHL players joined country star Dallas Smith on stage to end the night. Gord Bamford performs during the Country Thunder Humboldt Broncos tribute concert in Saskatoon on Friday. Current NHL players such as Sean Monahan of the Calgary Flames and Brendan Gallagher of the Montreal Canadiens were in attendance. Four-time Olympic gold medallist Hayley Wickenheiser along with Paralympian Greg Westlake were also there. The group of hockey players laid sticks in front of a Broncos jersey prior to the concert and the display remained throughout the evening. Olympian Hayley Wickenheiser places a hockey stick on a Humboldt Broncos jersey during the Country Thunder Humboldt Broncos tribute concert in Saskatoon on Friday. "We've been through a storm in this province of Saskatchewan these last few weeks," Premier Scott Moe said. "We were plunged into the darkness when this terrible incident took place. "And though there is still darkness, there is daylight on the horizon." The Hunter Brothers from Saskatchewan sang the national anthem and later encouraged the crowd to sing along to "Amazing Grace." Chad Brownlee played a rendition of Tom Cochrane's "Big League." A video message from surviving Broncos player Brayden Camrud was played before the performances began along with a message from Chris Joseph, whose son Jaxon died in the crash. The crowd, dressed in cowboy hats and boots along with hockey jerseys, also gave first responders in attendance a standing ovation. Brett Kissel, as well as fellow Juno winner Jess Moskaluke, played some of their biggest hits. The Hunter Brothers perform during the Country Thunder Humboldt Broncos tribute concert in Saskatoon on Friday. Scott Thomas, whose son Evan died in the crash, didn't expect to see such a big crowd. "You could see the pain in their faces, you could see the respect that they have for what we're going through as parents, as hockey people," Thomas said. "There's just a lot of emotion in the room." Just over a week ago, Thomas held a memorial service at SaskTel Centre for his son in his hometown. Thomas said his emotions hadn't changed much since the memorial service. "It's still raw, absolutely raw," he said. "There's still a void there that will probably be there for the rest of my life. But I know once everybody gets in there, the feeling of love is going to be the same." Edmonton Oilers head coach Todd McLellan, left, and Chris Joseph, who lost his son Jaxon in the crash, place a hockey stick on a Humboldt Broncos jersey during the Country Thunder Humboldt Broncos tribute concert in Saskatoon on Friday. Longtime Dallas Stars forward and Hall of Famer Mike Modano said that being with the families of the Broncos on Thursday night was really hard. "I think that was the first time a lot of those families had been together since the accident," he said. "It was really heart wrenching to just kind of be there and put some names to the faces finally that we've heard about." Former NHL player Glenn Healy places a hockey stick on a Humboldt Broncos jersey during the Country Thunder Humboldt Broncos tribute concert in Saskatoon on Friday. Humboldt resident Yvette Crane travelled to the concert and said that the Broncos helped the community a lot. "I used to go to their hockey games all the time and I just love 'em," she said. Note: The Country Thunder Music Festival, which booked the evening's musical acts, says money from the $65 concert tickets will also be donated to the families.